‘The school has changed me. It has taught me to be a good person, and to be brave’, says Alex, a member of Loyola College’s first graduating class. The first class of students at Loyola College Kasait in Timor Leste are about to graduate. Jesuit Mission Australia has supported the school from its inception, accompanying the students on their learning journey over the past six years. Continue your support for Loyola College by donating to Jesuit Mission. Here are the stories of two of the first group of graduating students. I started studying at Loyola College in 2013. They announced an opening for new students, and my mother and father supported me to apply. I have eight brothers and sisters, and my home is in the mountains. I was studying at the nearby public school. Now I live with my grandparents during the school week, because it’s a long drive to my parents’ farm, especially when it rains. At first, I didn’t enjoy it here because I had a lot of homework and there is discipline. It was a big challenge learning how to study properly. But since Year 8 I started to feel so much better. The school has changed me. It has taught me to be a good person, and to be brave. Before coming to Loyola, I was shy. Today, I can speak before other people. At Loyola, we are treated well, with respect by the teachers and staff. We are taken care of properly, we are provided with many opportunities to learn new things, and to know ourselves better. I feel this school is good because it teaches us to be responsible and compassionate, to work together as a team and to work for others. My favourite subject is Portuguese, but I also study Social Sciences, Literature, Economics, Geography, History, English, Civics, Indonesian and Tetum. My family is happy and proud, because I am the number two student in our Social Sciences class. Every day, I wake up at 5.30am and prepare my work for class. After school, I wash my uniform or play a game and watch TV. Then I study. I study from 5.15pm to 8.30pm every day. Then I have dinner and go to sleep. I feel very excited and happy because I have almost finished study in a Jesuit school. It’s important to me to practise what I have learnt, in my life after school. I used to dream of becoming a pilot in order to become rich. At Loyola, I learnt that more than becoming rich in the future, I also have to serve and care for other people, especially the poor. In Timor-Leste, the rich are favoured, the poor are easily punished. Now I want to become a Judge because there is a lot of injustice happening in my country. I want to serve justice to all, fairly and justly. I am from Manotutu, about 60km from Dili. Most of my cousins didn’t attend school. Now I live with my Uncle in Dili. The best experience I’ve had at Loyola is joining the Student Council in Year 10. I have learnt a lot about leadership. Before this, I didn’t know how to convince my friends to do something. I just want to learn how I could personally change, my friends and those close to me. I had to take a risk to do this, because it may have disrupted my study. But now I work hard every day for the Student Council. My favourite subjects are maths and physics. I went to the Maths Olympiad in Portugal. It was my first time to travel abroad and it was incredible. 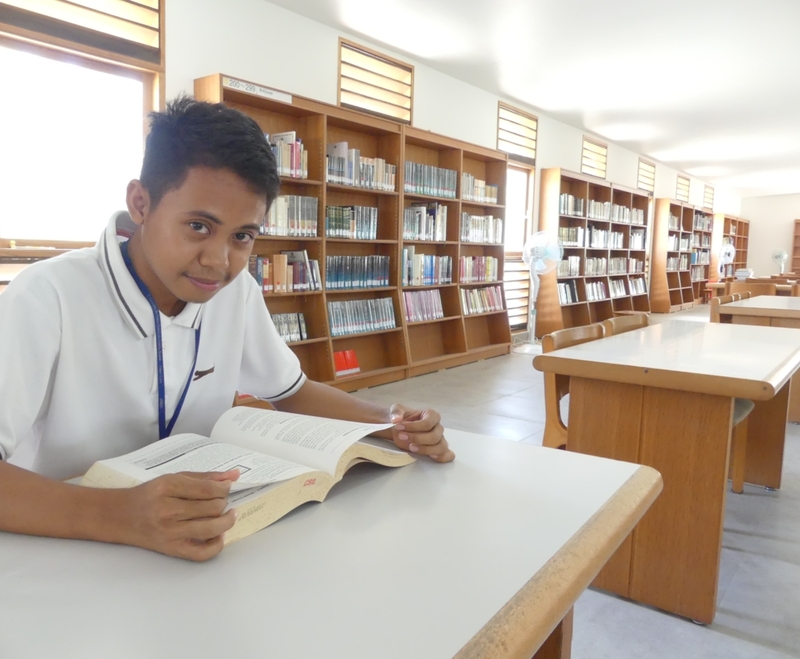 When I graduate I would like to study technology because Timor-Leste needs technology involvement and I’d like to be able to defend my country from cyber-attacks.